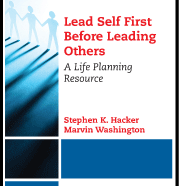 I am very please to announce the publication of Lead Self First Before Leading Others: A Life Planning Resource. In it, Stephen K Hacker and myself explore the concept that, at the core of exceptional leadership, is the ability to lead self. You can find the book on Business Expert Press or Amazon.